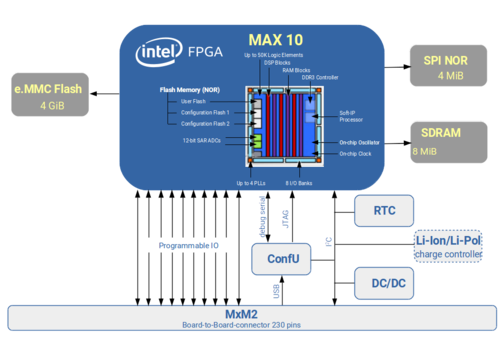 The SpiderSoM is a programmable, non-volatile solution based on Intel® MAX®10 FPGA, which enables it to deliver full-featured FPGA capabilities: support for various soft-core CPUs, video-processing algorithms, etc. The SpiderSoM promotes the free and open design concept: all resources, like i.e. design files, gerber, source code, etc. are available under certain open licenses. The SpiderSoM is available as a low cost and extremely flexible platform which enables user to setup a running system according to the required specification in a very short time. This module can be considered as a cost-optimized alternative to the MX10 module. MX10 and SpiderSoM modules provide a USB device interface implemented with a Microchip PIC16F1454 microcontroller (MCU). On the host side Linux is supported as Operating System, currently Ubuntu 16.04 LTS is marked as a reference base. UART - Accessible as standard serial device ( /dev/ttyACMx ). I2C - Accessible as standard i2c device ( /dev/i2c-x ). Requires driver. Connected to module PMIC, charge controller, RTC and FPGA. 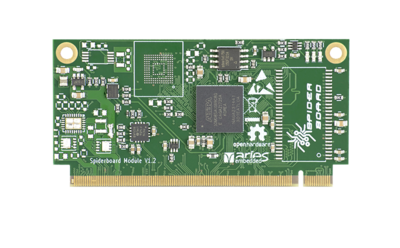 JTAG - Used with OpenOCD to program the FPGA (see Getting Started: Quartus Prime & OpenOCD for more). Additionally the MCU implements a bootloader supporting the DFU (Device Firmware Update) protocol (see Compiling and Programming PIC Firmware for more).